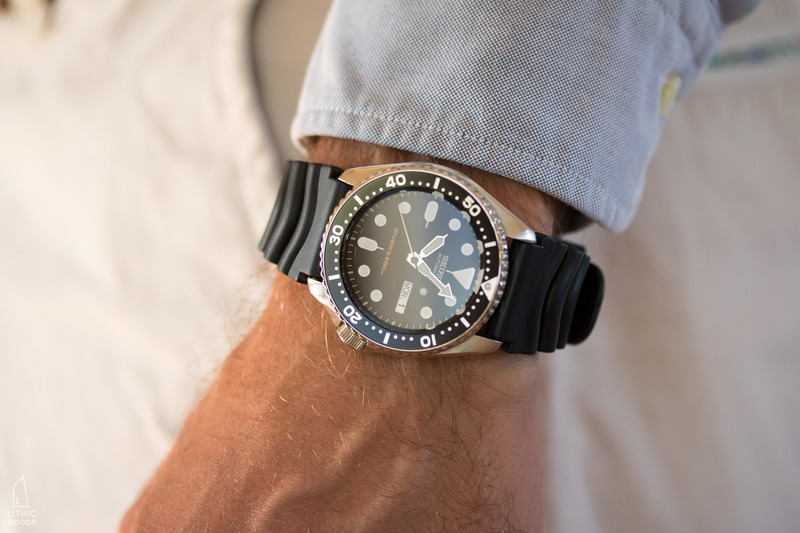 The SKX007 is the most recent stainless steel dive watch in a legacy of Seiko dive watches dating back to 1965. It’s theoretically no longer being manufactured,3 but had a long run from 1996 to 2016. As a true dive watch the SKX007 is rated by ISO 6425, the international standard required for a dive watch to be called a dive watch.4 This standard drives many of the watch’s designs, including water resistance, bezel function and markings, crown, face design including “Diver’s 200m”, hand design, and case back. 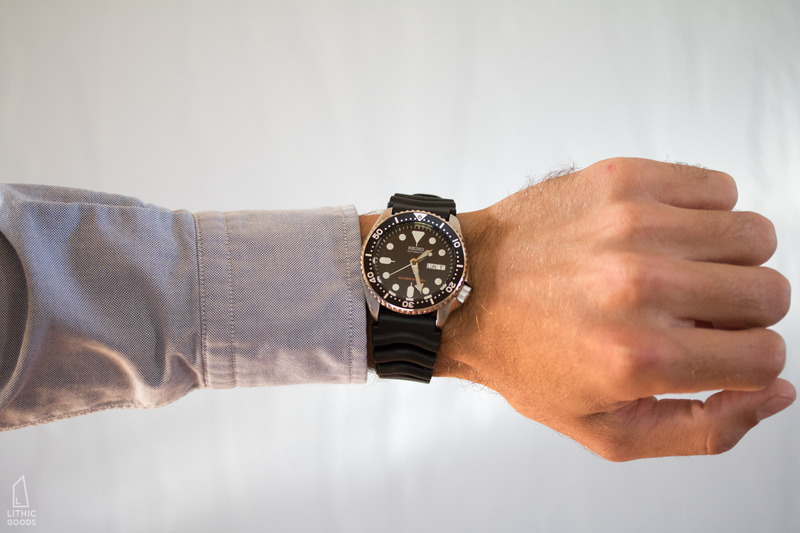 As a non-diver the 200m of water resistance is clearly well in excess of my needs, but it adds a level of confidence, that no matter what I do, unless I break the crystal, the watch will never be compromised by water. This level of durability was one of the main drivers of my purchase. 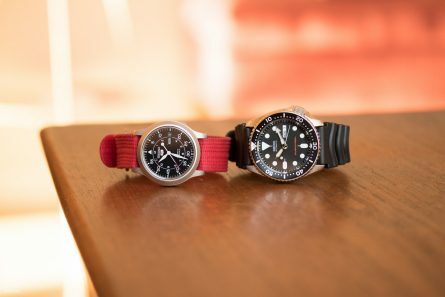 I discovered the SKX007 indirectly through two older gentlemen. The first was Robert Redford who wore the SKX009 in his film All Is Lost. After watching the movie I researched the watch and first set my eyes upon the SKX009.5 Three years later, while hiking the Tahoe Rim Trail, I came across Bill, who manages trail maintenance for the Tahoe Rim Trail Association on the north eastern portion of the loop, also wearing the watch. These were two seriously crusty, sun baked, old men who have lived a life outdoors. 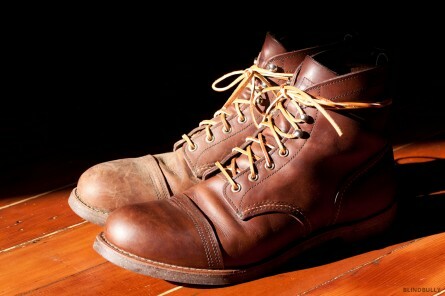 Yes, Redford wore it in the film as part of his costume, but he’s a known outdoor enthusiast and Bill is the real deal. 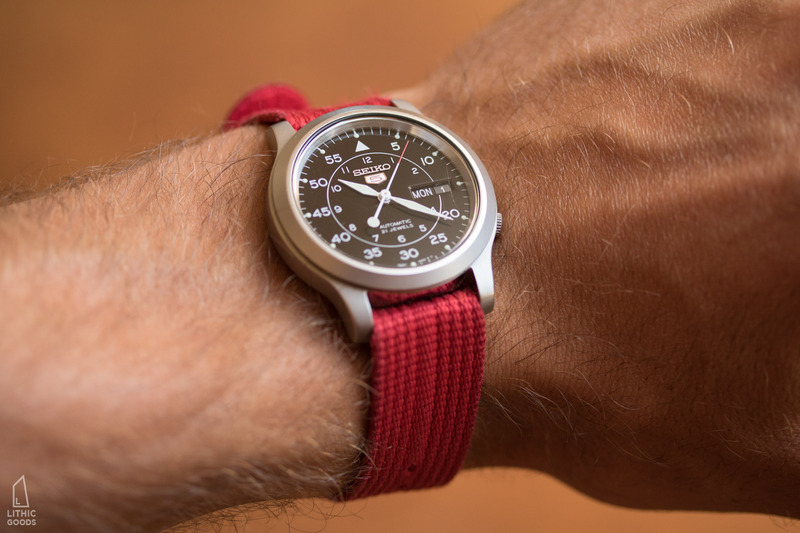 After the hike I conducted further research to ensure the watch had durability in addition to looks, and it turns out to have quite a following for it’s price/durability. 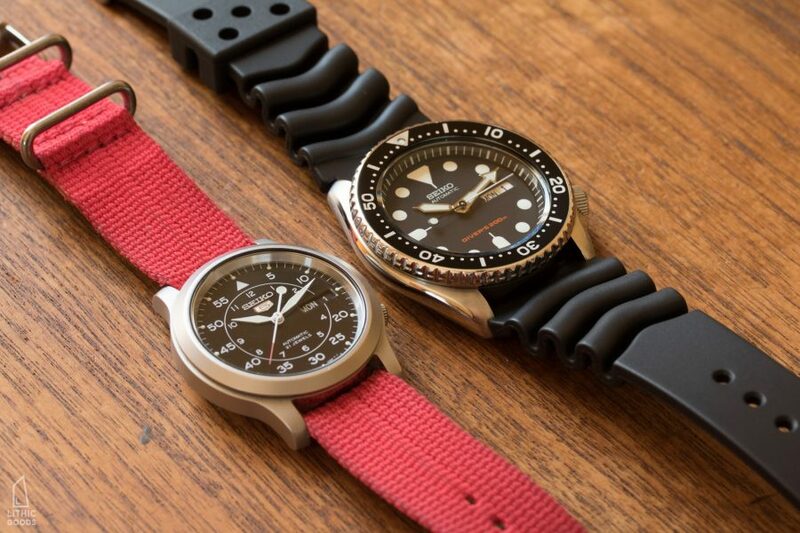 In this research I found the SKX007, which in monochrome black and stainless (except for the orange “DIVER’S 200m” text) is a little less flashy and more easily paired with a variety of bands and clothing. I also researched the red portion of the SKX009 dial, and it appears to be just an aesthetic design, since the red is at the beginning of the count up timer, not the end where it would indicate it’s time to go. Perhaps this is because dives have different lengths, so a redline couldn’t be set. Divers also mention that colors fade with depth, so once you’re in the deep the blue/red can’t even be perceived. That said, the SKX009 is a great looking watch, but I’m glad I ended up with the SKX007. The watch has a traditional, left-rotating, count-up, dive bezel with 120 positions. 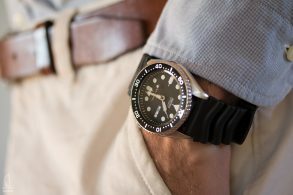 This function allows a diver to rotate the arrow of the bezel to the current position of the minute hand at the beginning of their dive, and if the bezel is accidentally bumped during the dive, it can only rotate so as to shorten the length of the dive, ensuring there will be plenty of air in the tank. 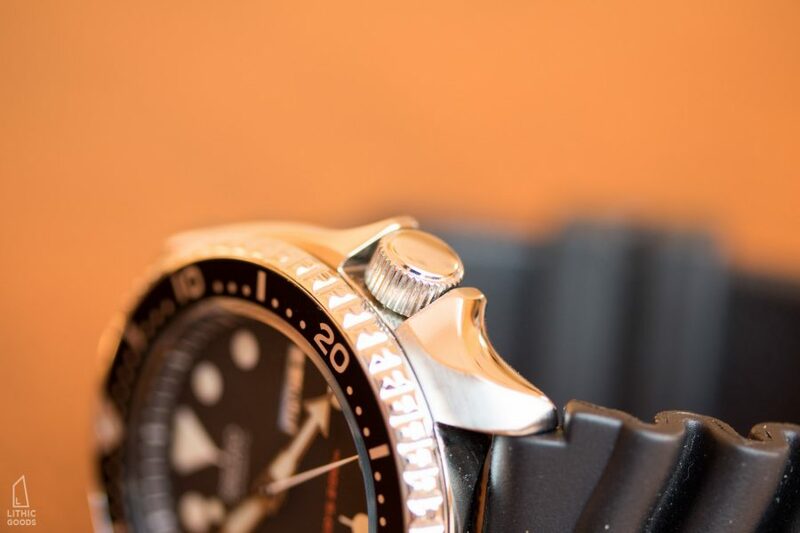 The knurling on the bezel is simple in it’s continuous repetition and it is easy enough to grip to adjust with smooth motion, but has plenty of resistance to make accidental adjustment unlikely. The bezel also include a dot of lume in the triangle so as to be visible in the darkest of depths. The crystal has a planar surface with a chamfered edge creating about a 2mm gap between the glass and the bezel. It’s made of Seiko’s scratch resistant Hardlex glass, which is more durable than sapphire in a fall, but not as hard, and thus more easily scratched in day to day wear. 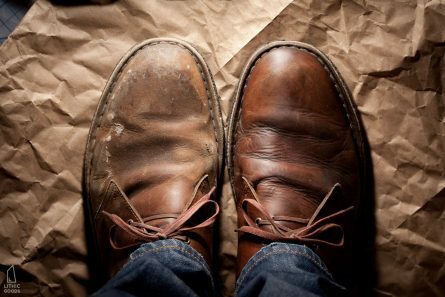 This is a difficult tradeoff to measure and usually comes down to personal preference. 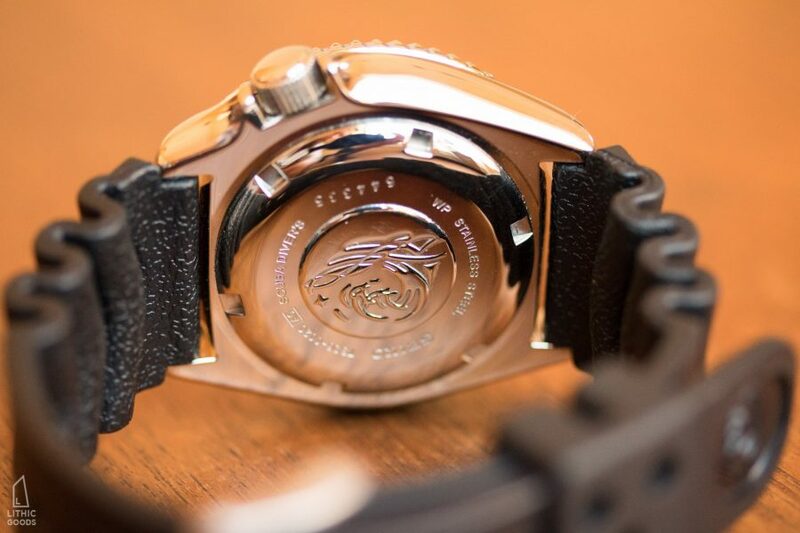 More expensive watches typically come with synthetic sapphire crystals, which isn’t surprising, since it’s a more expensive part, but it’s not always the best solution. 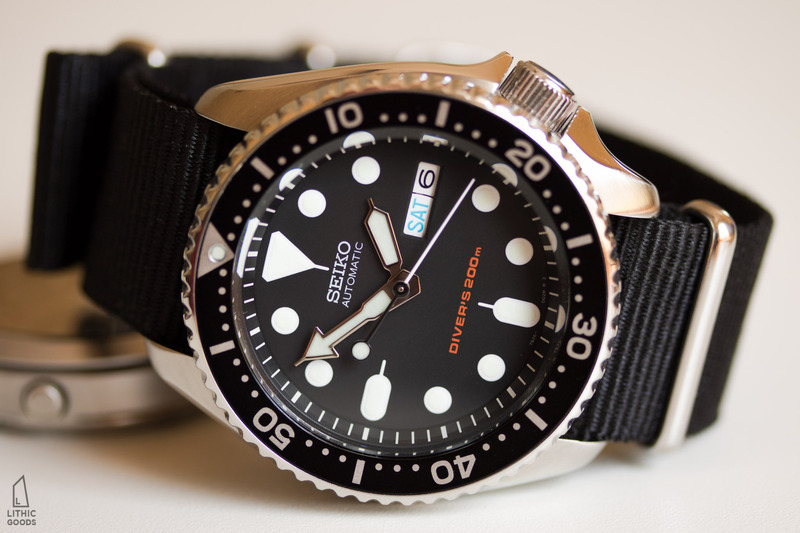 For the SKX007 it’s not a big deal, since if you scratch the hardlex and decide that sapphire is what you want, it’s readily available on the modding markets. The flat black face with white dots, ovals, and triangle are simple, clean, and informative. To balance the 3 o’clock oval, the day & date window has black text on a white background except for Saturday which is blue and Sunday which is red. The size of the LumiBright ensures excellent nighttime/depth performance, and the 12 o’clock triangle provides excellent orientation. The large hands are easy to read, however I find them to be slightly clumsy, with the minute hand as the worst offender: it’s variable widths leading to a large arrow finished with a needle tip feels chaotic. If I mod this watch it’ll be a hand swap for a cleaner set of simple sword hands from a Seiko SNZH55. 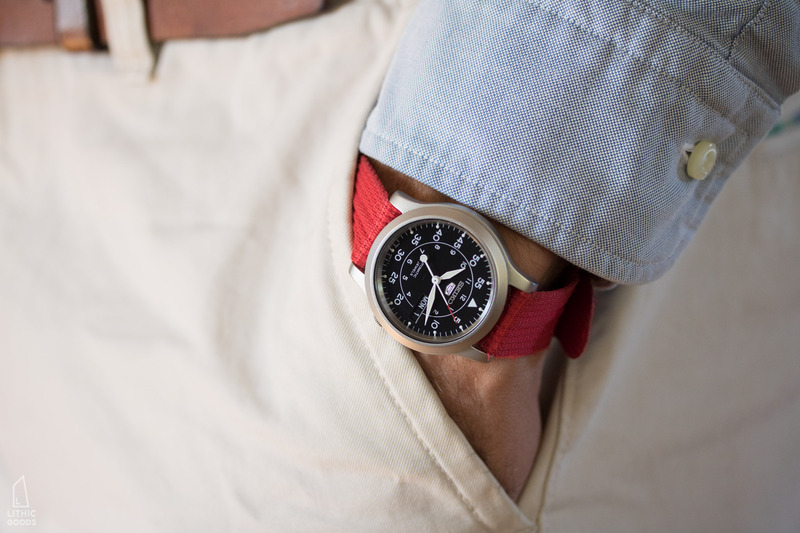 The stainless steel case doesn’t compete with the face of the watch and generally goes unnoticed. It’s 42.5mm wide not including the crown, 13mm thick, and 46mm lug to lug with 22mm wide lugs. It fades away with a softly brushed top surface and polished edges that allow it to disappear onto your arm, leaving all the attention for the polished bezel and dotted face. On the right side the case flares off the radius at the four o’clock position to hug and protect the crown. 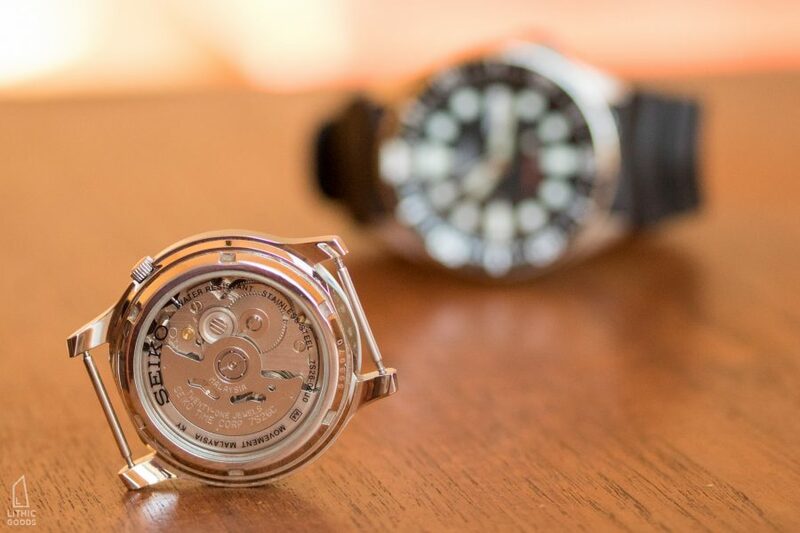 The coined crown screws down to the case for enhanced water resistance. The protective prongs and threaded crown definitely increase the difficulty of adjusting the crown, but its still easy enough to unscrew as needed. 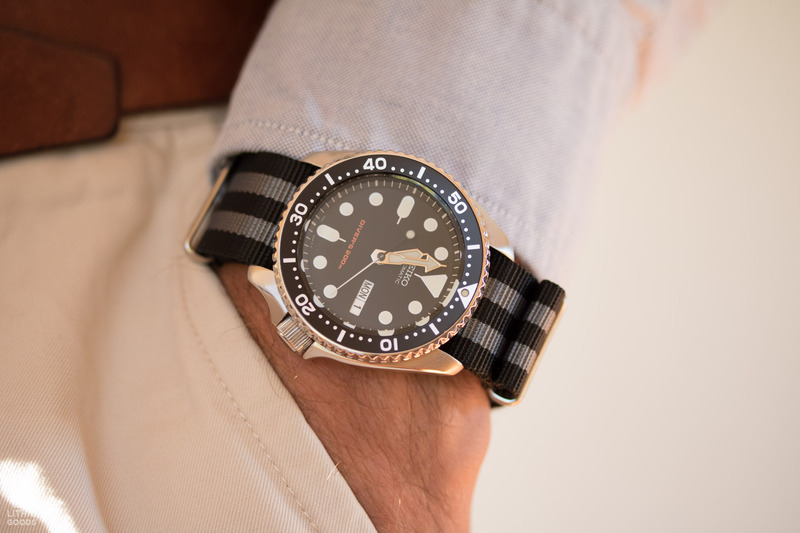 The stock rubber band is practical for diving, but it’s rather bulky for every day wear. That is to be expected for a dive watch, so I threw in a few bands along with the watch order. Aesthetically my favorite band is the grey perlon slip-through. It doesn’t have the most beautiful buckle, but the strap itself is nice and the neutral grey looks great next to the black and silver watch. 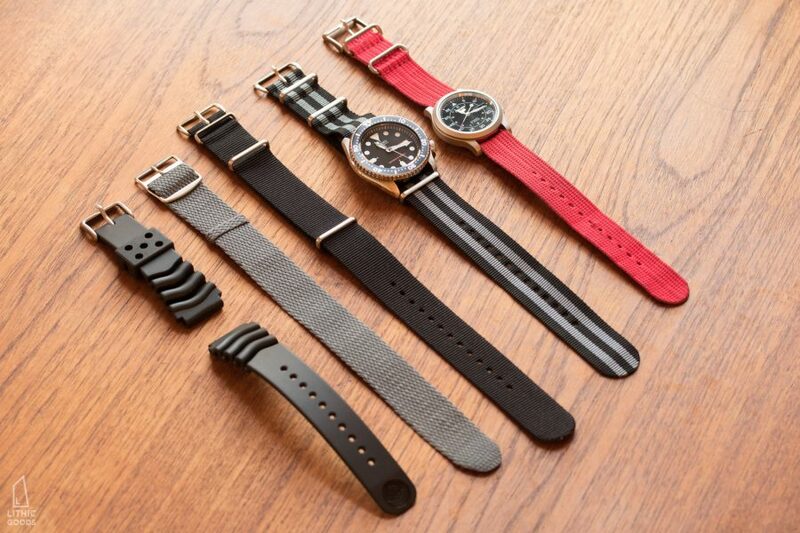 The runner up would be the black and grey nato, which looks just as good, but slightly bulkier than the slip-through. I purchased the SKX007 with the rubber band rather than the stainless band, since the stainless increases the cost and I don’t think I’d ever have worn it. As a dive watch, it’s not a formal watch, but I’d say it dresses up quite well,7 and I do plan to wear it to formal events. For those occasions I’ll swap on the black nato strap, which, with it’s simple, monochromatic color palate will disappear amongst a traditional black tie kit. All in all the SNK007 is a classic, entry level, beater, automatic, dive watch with enough versatility to be the the only watch you’ll ever need. And that’s my plan: to wear this watch for the rest of time. 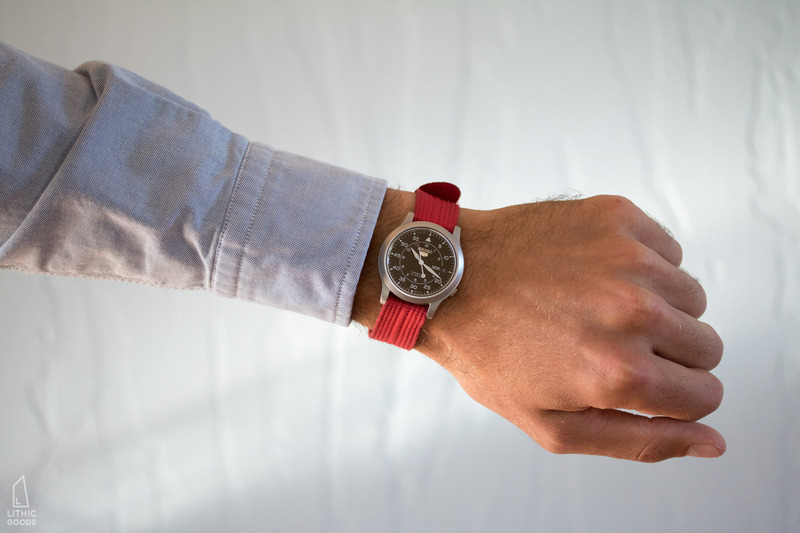 Wrist And Style 22mm Dark Grey Perlon Strap. $15. Purchase. Clockwork Synergy 22mm Black Nato Strap. $12. Purchase. Clockwork Synergy 22mm Black & Grey Nato Strap. $12. Purchase. Spring Bar Tool (not pictured, but useful for switching bands). $5. Purchase. Seiko SNK809 Automatic Stainless Steel Watch. Malaysia. $60. Purchase. The SNK809 military watch is a much smaller, subtler, and simpler watch as compared to the SKX007. It comes from a large family of Seiko 5’s, which all have the same case and movement with different faces, surface finishes, and bands. The closest relatives with identical designs in different colors are the beige SNK803, green SNK805, blue SNK807, and red SNKM95. The case is bead-blasted for a satin finish and it’s black dial with sleek, white, sword hands has a notable elegance. I bought this watch after my second Timex Weekender’s Indiglo failed, but I was already tired of the Timex’s loud quartz movement that would wake up my girlfriend (who would then wake me up). The SNK809 is similarly sized, but the 7s26 caliber is very quiet, only audible if my ear is within 5 inches of the watch (while the timex I could hear across the room). The SNK809 is not a dive watch and thus is rated to the lesser static depth of 30 meters. Static is important to note, since an excess of 30m of pressure can be produced with a jet of water such as a hose, and thus it’s possible for water to enter the watch without being submerged. That said, I’ve worn this watch while diving off a catamaran down to a depth of at least 12 feet. And this was with the crown facing the water when breaking the surface since it was on my left hand. I’ve worn it washing my hands and in the shower. I’ve worn it in the backcountry on a 10 day hike around Lake Tahoe, fishing in alpine lakes, and to the summit of Mount Kilimanjaro. I’ve worn it rock climbing (which is foolish and likely how it became scratched). And it has done all this with ease and accuracy. The bezel is a simple, smooth bevel off the crystals surface down to the seam with the case. Researching online it appears to be press fit into the case with a gasket. 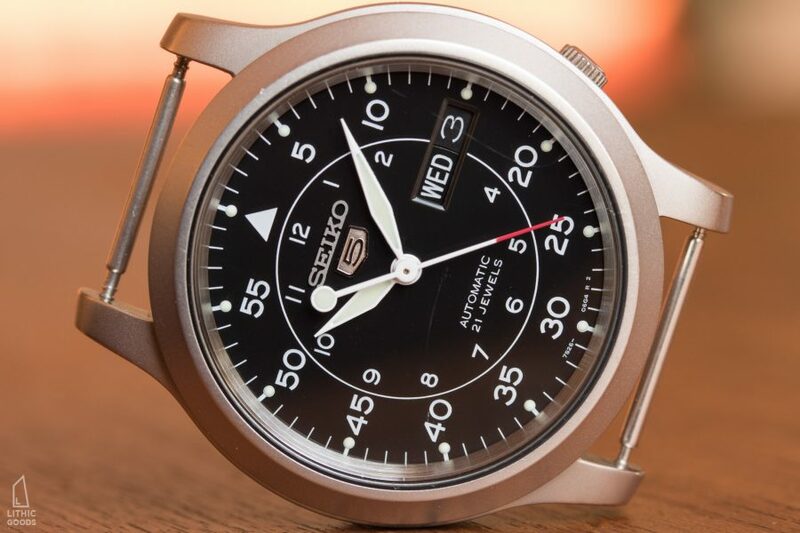 The SNK809 also uses Seiko’s Hardlex glass with a flat surface and the smallest edge chamfer. Since I’ve worn this watch a bit it has received scratches in a couple locations. They are only noticeable when looking for them, with the glass wiped clean, but they’re there. To see the larger scratch in the photos look for a backwards J from the 3 to 4 o’clock position. Given I wear this watch hiking, camping, climbing, fishing, and everywhere else, scratches are going to happen and whatever it was didn’t break the glass. There are many elements involved in a watch, but the face is one of the most important and was one of my main draws to the SNK809. The military style hours & minutes line up well with the sharp, sword hands and are simple in their repetition and light weight. The lumibrite markers are small, but still visible in the dark. Unfortunately, since they are the same all around the dial, there is no way to delineate the 12 o’clock position, which would normally be accomplished with two dots or a triangle. As such it can be difficult to quickly tell the time at night. If I mod this watch it’ll be to add custom lume to the 12 o’clock triangle. The text in the day & date window is sans serif white with a black background. This design works well to maintain the balance of the face and let the text fade into the pattern. Sunday is the one exception with red text. The case, like the bezel, is a satin finish. It’s 37mm in diameter, 11mm thick, and 43mm lug to lug with 18mm wide lugs. Tucked in a counter bore in the 4 o’clock position for safe keeping, the coined crown is very small, but easily popped out with a fingernail. It also has the same satin finish as the case and has the same operation as the SKX007, since they share the 7S26 movement. Unlike the SKX007, this watch has a Hardlex case back, revealing the caliber within. As a first time automatic watch owner (and engineer), this was definitely a draw as I can peer into the intricate mechanics of the watch. While aficionados will toss up their noses at simple movements lacking aesthetic machining, I enjoy the utilitarian 7s26. 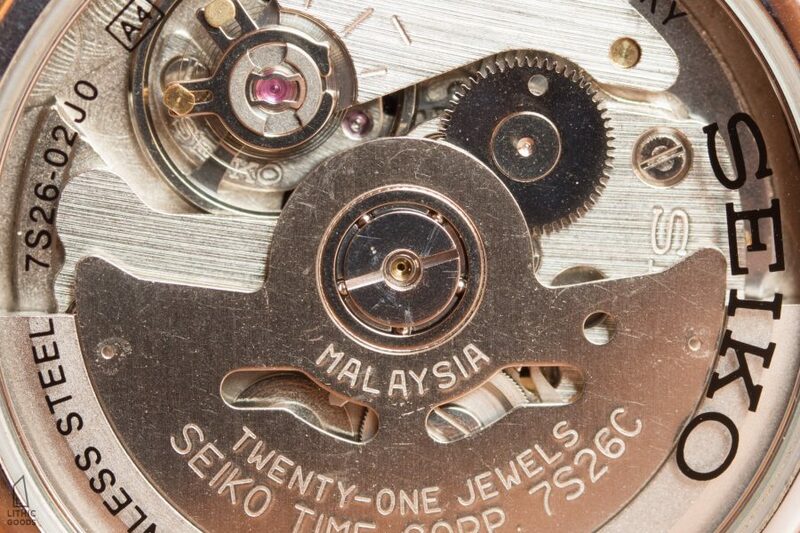 Watching the balance wheel whipping around nearly frictionlessly on synthetic ruby jewel bearings in a very accurate $60 watch is an incredible example of today’s industrial manufacturing capabilities. I’d say that the biggest negative of the SNK809 is the band. I put it on when I first received the watch and was very disappointed. They should simplify and ship with a simple, black, slip-through strap. I’ve since thrown away the OEM band. This isn’t a big deal though, since bands are so easily and frequently replaced, it’s the least important aspect of a watch. Currently I’m using my old Timex band, which almost fits, but is just a touch too wide. The red matches the second hand and Sunday text, which I enjoy, but I think I’ll either make or buy a leather band in the future. 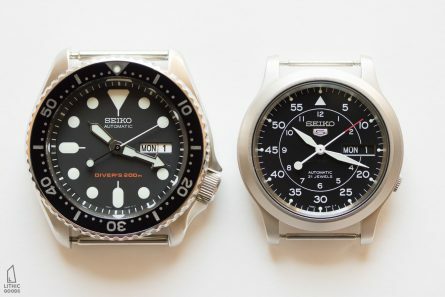 “SKX007 is also no longer in production but can be found on the secondary market, which is unfortunate as it represents the entry price point into the world of Seiko diver’s watches – as a matter of fact, it probably represents the entry price point into the world of genuine, ISO-compliant mechanical diver’s watches, period.” Seiko SKX007 by Hodinkee. Robert Redford in All Is Lost by Best Watch Brands HQ. Seiko Date Finder by Watch Sleuth. 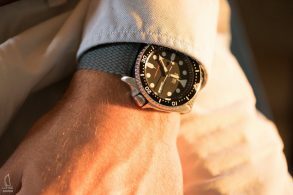 SKX007 with a blue blazer by Hodinkee. 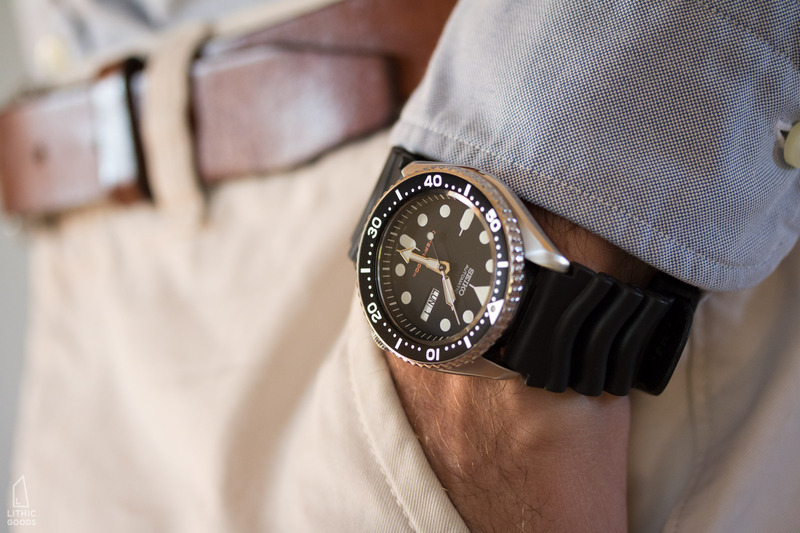 Seiko SKX007 by Worn and Wound. Two Seiko 5’s SNK803 & SNK809 by Worn and Wound. Seiko Series 5 by Hodinkee. Cheap Seikos, the grey market, and fakes by The Antiquarian Traders. SNK809 is such a great watch for $60 and it works with all kinds of straps. I paired it with black leather strap and it is my everyday watch. Also, especially great for small wrists as I found 38mm the biggest case I can go to. Thanks for the comment. I haven’t tried a black leather strap, but I bet it looks great and would work well for dressier occasions. I’m thinking of getting or making a simple veg-tanned leather slip-through band which I think would look great on either watch. Thanks for the review. I’ve found that the SNK 809 looks beautiful on a brown leather nato strap.